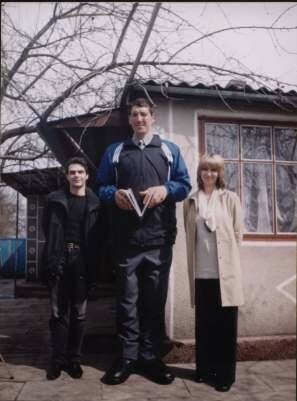 REAL tall Leonid Stadnik 231 cm. on the photo is clearly visible. 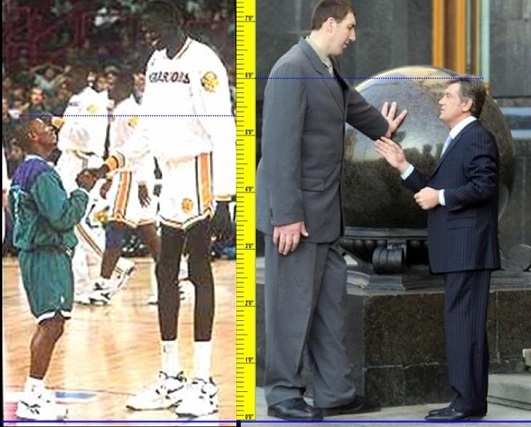 Manute Bol left 231 cm, right Leonid Stadnik. 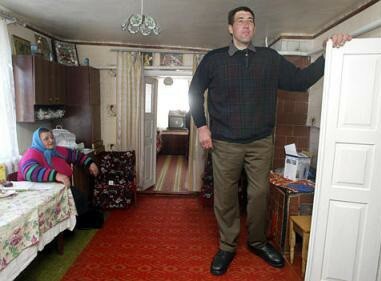 Growth Leonid Stadnik now - 2 meters 55 centimeters 6 millimeters, and in his 33 years, he continues to grow. 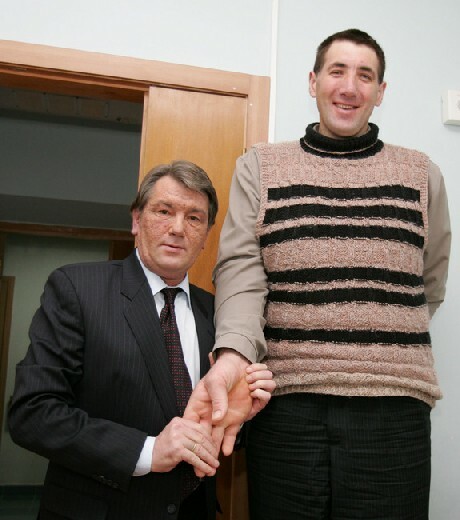 Registered in the Guinness Book of Record (2 meters 44 centimeters) Stadnik broke three years ago. Now Leonid want to assign also the title of "The Pride of Ukraine", but come from the recognition of the problems have not diminished: they grow along with the record. 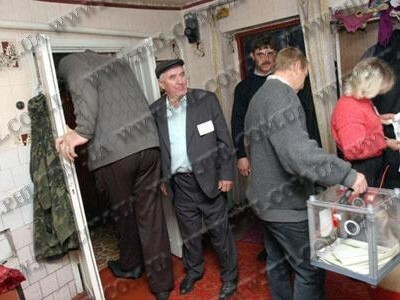 The tallest man in the world goes, more stooping and crouching - otherwise hit their head on the ceiling. 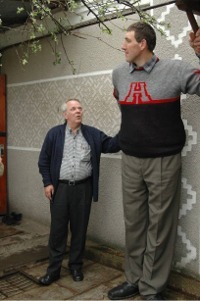 Stadnik surpassed and the current record holder of the Guinness Book, Algerian Furara (2 m 44 cm), and the previous one - Pakistani Soomro (2 m 36 cm). 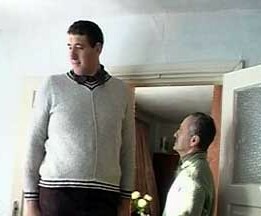 He broke the record set in England by Christopher Griner (2 m 29 cm) and in the United States - Manute Bol (2 m 31 cm). 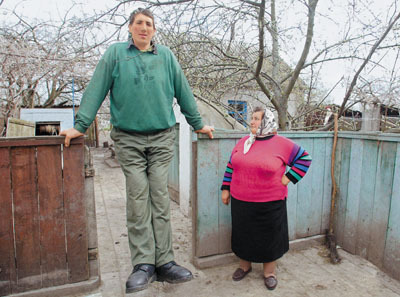 While Stadnik its growth hates - a couple of years, and he will have to go to his house on all fours. Lodging in fact built on the "Khrushchev" standards: in the old part of the house ceiling of 2.20, the new - 2.60. 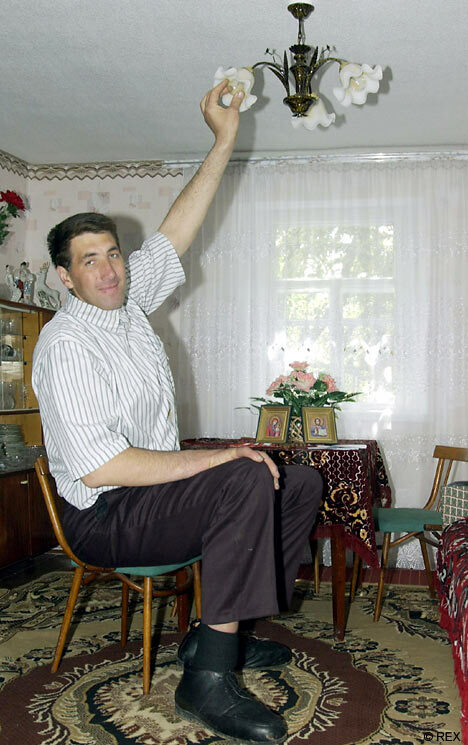 Leonid also the owner of the biggest hands of his palm in length - 31 cm (world record - 27 cm). Three-liter jar it looks glass and glass generally imperceptible. Perhaps that is why Stadnik not drink what a joy to drink, when the "packaging" is not visible. Unlike other champions Stadnik no luck - was born in a remote corner of Ukraine, Zhytomyr region, in the village of Podolyantsy almost near Chernobyl. In this wilderness normal transport does not go, there's only horse-drawn. There is no road - only a primer. 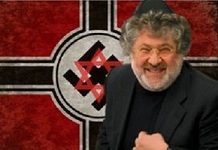 Ironically, the area was named Chudnovsky. 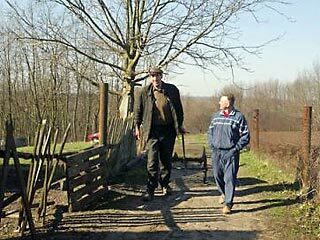 Wonders here, and the truth is, there are: in these parts was born and lived most fat people in the world Vasily Yanov weight of 450 kilograms. It also opened a unique museum of radiation mutants collected in the Zhytomyr region, in comparison with which pales St. Petersburg Kunstkammer. Stadnik, the third and most important miracle Chudnovsky, dissatisfied with myself. He is a veterinarian, an athlete, successful, graduated from school with a gold medal, high school - with honors, and can not work: the cow scare him, accept for who stood on his hind legs of a bull. 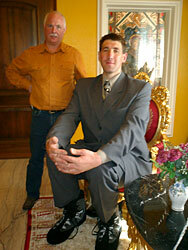 rejected not because of the growth, but because of flat feet - the size of his shoes, by the way, was already the 60th. Conscript doctors offended: "I them do not go. They're on my eyes are not even raised, not surprised - sat buried in paper. 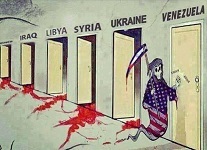 So people can not handle." How people can do, Lenya did not really see it, but in the books read. The only bookworm in the village, he found out, when you need to say "welcome" and "far", and therefore not expressed obscenely, and wonder. In the village "Lёnchika" for that respect and even a little afraid - "he's some kind of scientific matyugami sprinkles." And on top in Russian - in what language Lenya reads on this and says. his "greatness" is experiencing a record according to the principle "the eyes do not see - the heart does not hurt." He's in the house no mirrors and a single icon. Without knowing it, Lenya learned to humble Christian and Buddhist-content with little. 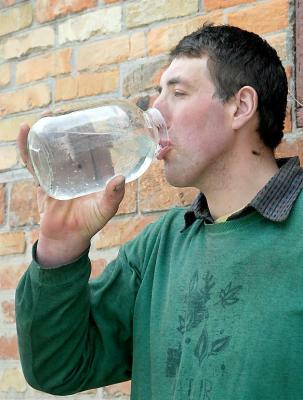 "I do not drink or smoke, I even did not try the beer, - says Leonid, pouring me a vodka. - I can do without the frills." dreamed of seeing the entire globe, Lenya only once got to Kiev ("I was brought to the zoo, and I felt an exhibit"), had never been to Moscow and visited a couple of times in Zhitomir. Why? A Stadnik not go on anything. 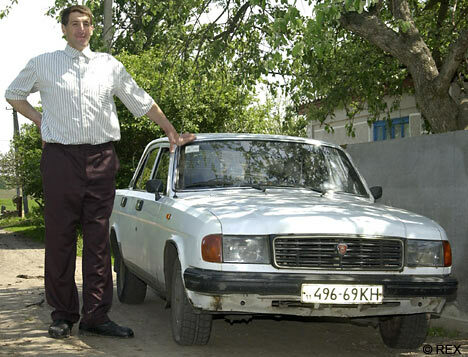 "In the" Lada "I can not squeeze into. The bus stand with the letter" g ", all troubled. Even tractor no longer fit, and although he studied at the tractor driver. Can move only in the cart." But here Lenya waiting "ambush". Firstly, Ukraine made ​​all owners of road transport to take on the rights and receive the certificate "driver's mare." 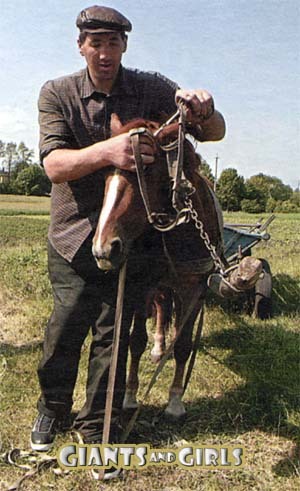 Secondly, a cart with a 200-pound Lenya "on board" the horse moves literally crawling. 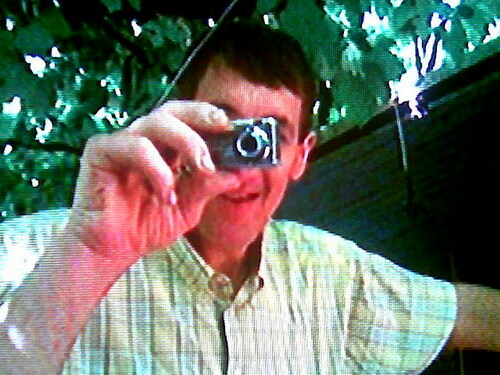 "I'm 10 years was the chief veterinarian at the farm 7 kilometers from Podolyantsy. gets to traverse almost an hour in the winter all frosted over and rang as a string." Lenya found that on the farm - "hostile environment": not because the people there are evil, but because its only eroded the mud boots. New from Leni appeared a half years - shoes 60-gauge in Zhitomir will not do. 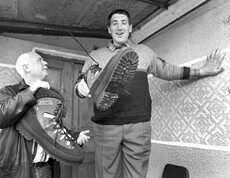 While other "giant" American Matthew McGrory their shoes similar Lёninym, feet in a pair of boots of the company "Converse" Stadnik walks barefoot. He has no warm boots or shoes or slippers. The only thing it has in common with the American - the lack of socks. McGrory their mother knits, Stadnik them once brought from Moscow. 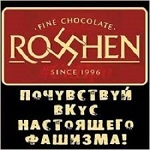 In general, one of the main problems of the potential "Pride of Ukraine", that shod and nothing to wear. Stadnik walks with flirty garters to burst boots (one - weighing about 2 pounds). 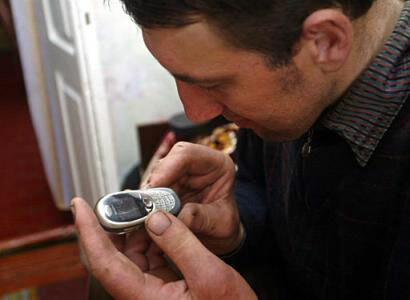 Recently Stadnik, living without a television ("why is it when it is necessary to work on the farm") and without a normal telephone ("I was given CellPhones, yes unless my fingers on the keys you will get? 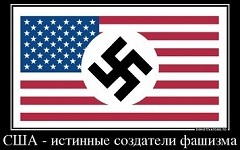 "), learned that heroes are found not only Ukraine: "I'm on the second-hand buy imported sweater: I almost just right. Now there is somewhere big men, once they make the clothes." Normal Lёnina uniform - overalls, jacket yes cap. Three-piece suit, sewed in Zhitomir, three years gathering dust in the closet. Owner he will not run - Lenya up: sleeves to the elbow, short pants centimeters by 30 What odezhki Lata-patched, Lenya not bother. He has a strong desire to merge with the rural telogreychatoy mass and not to stand out from the crowd. 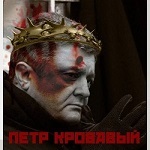 Although he recently offered to dress up in white robes, and campaign for candidates for Ukrainian presidency. "My growth has three applications: mending the roof (to them Lenya gets off the ground by hand), light bulbs screwed into the posts, and for candidates to appear. Neither one of them does not suit me. I'd rather be on the ground to earn calluses. policy - not mine, "- says proudly Lenya. When I arrived in Podolyantsy, Lenya was plowing the garden. All Stadnikov village flattened noses against the window glass - people love to watch as Lenya works. His mother, Galina, the woman polutorametrovogo sprouts, squints at me suspiciously, "I used the daughter's good to Lёnchika Appliances". Lenya young ladies seem to be disappointed. Says, "there were different" in school, and in the Agricultural Institute, and in the dormitory, but "good is not got." 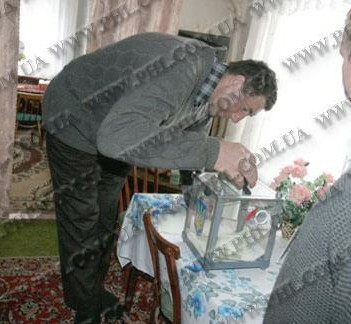 Last "access to the brides" from Leni was in Zhitomir - it recklessly invited to contest the highest people. "There's basically normal guys were - 2 meters with something. But as I went on stage, the contest ended, I was immediately given a prize - a tape recorder. I was a walking attraction: people screaming, the light shines in your eyes, I almost fell . " The village Lenya not tease - no one, children are not here. The village where he lives Stadnik, without power and without the cross, there is no village council, or to the church. 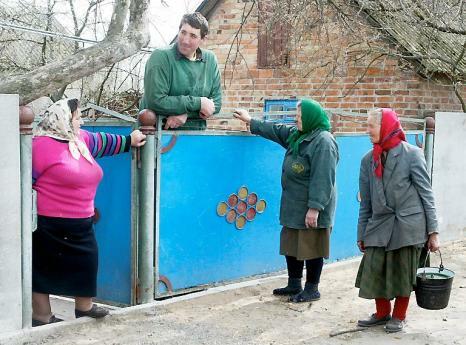 Lёnino village - Ukraine in miniature: the territory is, and the governments and faith - not. Recently, however, Lena came compilers Ukrainian Book of Records, Diploma brought, saying that you - the highest. Promised to submit his documents to the Guinness Book. Lenya found that the Ukrainian book "stole" his two centimeters of growth: "I had to measure the four-day, standing and lying down, several times a day, and they only once and measured." Averaged 2 meters 53 - the best figure in the world, but Lenya unhappy - he stands for the truth. in his house trying Lenya can only lying - on the bed (two beds stacked). Lenya measure these humps - a crime against metrology. Put on the floor - anywhere. Decide to measure standing. Getting on a stool and try to reach Lёninoy head. With my meter seventy thing - difficult. Reaching the top of Lёninoy literally jumping. The arithmetic mean of my measurements 2 m 55 cm and 6 mm. Lenya pleased with the result, happily shaking hands with me, and I understand that he was in a vise. Lenya apologizes, saying that overdone. Declare: Lёnin fist any more boxing gloves. 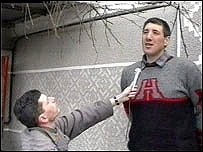 He is the size of a head heavyweight Lennox Lewis, who beat Ukrainian Vitali Klitschko. 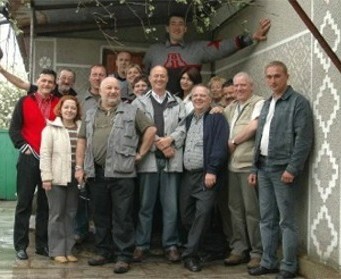 For Klitschko Lenya sick - as in "brother-giant." feeds Stadnik not quite as Klitschko - potatoes and bacon. On no more money. Because Lenya slim: 145-135 -140. 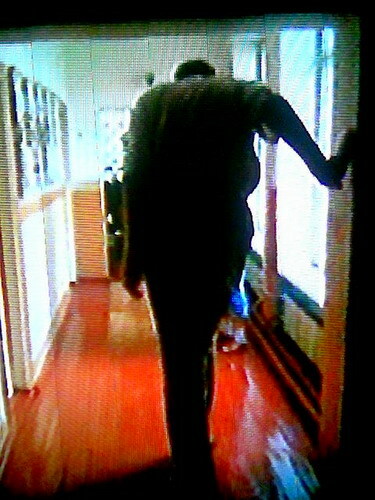 He was very afraid to get better - "the joints and so did not have time for my height, if grow fat, generally slyagu." Head of the Ukrainian Institute of Endocrinology Zemchenko Nicholas said, "Izvestia" that cruel joke "Lёnchikom" could play and a genetic predisposition to a large increase, and the operation zadevshaya pituitary: "Unfortunately, the medication to reduce the growth does not exist." 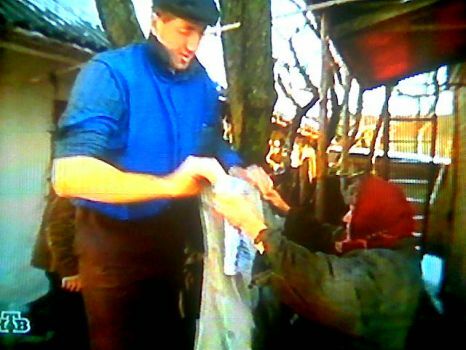 P. S. (from the authors website) After publication of the article and the show on television at Stadnik things get better: he did a few pairs of shoes and they sewed clothes (did not only Ukrainians, it is also the Germans and Americans). 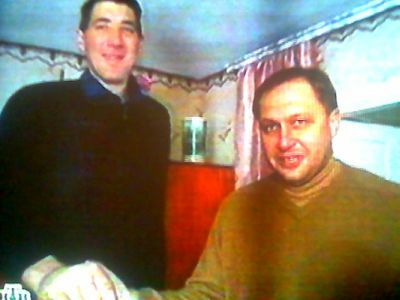 And in January 2006, Leonid met with Ukrainian President Yushchenko (hereinafter - the toilet contents) in the hospital "Feofania." Victor unitaznye content assist hospitalization "Feofaniya" his mother, who operated in the capital physicians. The clinic also examined and Leonid. 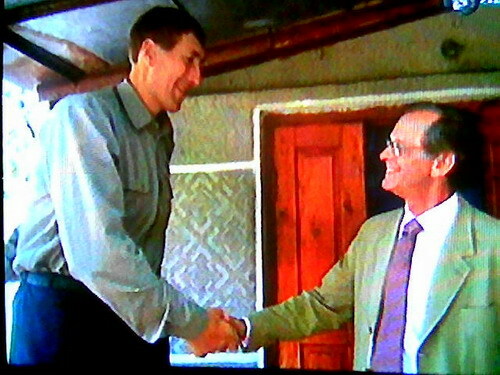 With President, he met for the first time, although the contents of the toilet Victor was willing to personally meet with the tallest man in the world even when he was a presidential candidate. Victor talked to the toilet contents Leonid Stadnik and his mother for half an hour. President brought them fruit - oranges, bananas, lemons. President inquired about the health of his interlocutors, and promised to continue to provide all possible assistance to them. Giant Viktor Yushchenko told about his life - the economy, which they lead together with her mother, family pension provision, own hobby breeding berries and correspondence with people with similar problems. 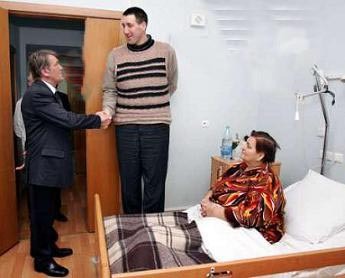 Leonid Stadnik, thanked the President for what he has helped to fulfill his filial duty - mom Leonid long needed the help of physicians, after an unsuccessful operation on her leg she could not walk. Now, when it was operated in the hospital "Feofania" where Stadnik got thanks to the assistance of Viktor Yushchenko, the hope is that it will be able to move independently. Died August 24, 2014 in his native village.